If you are a researcher interested in learning about the latest life science solutions available on the laboratory supply market, Biotechnology Calendar, Inc. invites you to meet other researchers and lab supply sales reps at our Houston BioResearch Product Faire™ Event on January 30th, 2014. This event is the perfect opportunity to network with colleagues and find the right life science solutions to your problems in the lab. Researchers love our Texas Medical Center life science event because registration is quick and easy, and they know that everyone in their lab is invited to attend. Our delicious catered lunches offer you the chance to take some time away from the lab or the classroom and enjoy great food with colleagues. Our event staff are friendly and accommodating, and they are there to direct you to informative seminars, prize tables, and lab suppliers offering life science solutions you may be interested in. One of the fun prizes Biotechnology Calendar, Inc. offers is our Science Ninja t-shirt. At past events, researchers and other attendees have received t-shirts and taken pictures at our photo booth. To see some fun pictures of Science Ninja attendees, we encourage you to look at our Instagram photos. There you will also find mouthwatering pictures of our catered lunch items, included sandwiches, vegetable trays, brownies and lemon bars. Other food items we feature at our events include bagels and cream cheese, cookies, coffee and tea. When you attend a Biotechnology Calendar, Inc. show, you also have the opportunity to win the drawing for a major prize, such as an iPad. Our sponsored prize table gives out lanyards and gift bags to attendees who visit their booth as well. Prizes and food are not the only reason you’ll want to attend our Texas Medical Center life science event. You’ll meet other researchers at our event who may have insight on research you’re working on, and you’ll be able to learn about what your colleagues are working on as well. Biotechnology Calendar, Inc. life science events are an enjoyable way to spend quality time with your colleagues in the lab as well as in other life science departments, all in a professional science research atmosphere. 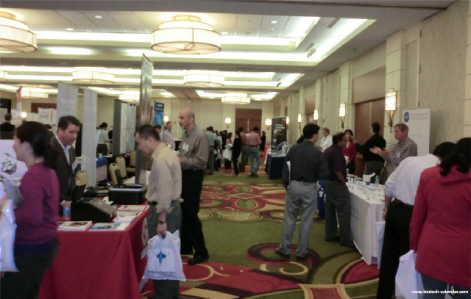 Sales reps at our life science events are eager to meet you at the Texas Medical Center. Lab supply companies are interested in researchers’ goals in the lab, and they may be able to assist you with a life science solution that can work as this missing puzzle piece to your research process. If you are a researcher, lab manager, post-doc or life science purchasing agent interested in discovering life science solutions and meeting researchers and lab suppliers in Houston, Biotechnology Calendar, Inc. invites you to attend our Houston BioResearch Product Faire™ Event on January 30th, 2014. Biotechnology Calendar, Inc. is a full-service science research marketing and events-planning company that organizes life science events at top research institutions across the country. If you are interested in attending life science events closer to home, we encourage you to view our 2014 calendar of events. For more information on our Houston BioResearch Product Faire™ Event, click on the button below.